IKEA stores now populate the suburbs of America. They spring up wherever there is enough space to hold their gargantuan facilities. Why are they so popular? Price is one factor, but also there's something called the IKEA Effect: You value something that you build more than something you buy ready-made. This is true, even if the stuff you buy already put together is clearly better. This is a nightmare for anyone who receives a home-made sweater for Christmas, but it's a goldmine for people who want to work a little less for a little more money. Build-your-own product stores do very well, even if their output is amateurish. The difference between what people will pay for outright, and what they'll pay for if they get to put in a little effort, is so pronounced that scientists decided to name and test it. The IKEA Effect has been tested in a number of different scenarios. The first was the straight-up assemblage of IKEA furniture. People were willing to pay more for the furniture that they assembled than the furniture that came pre-made. This was not the case when they made only part of the furniture. Those who put together only a chair leg or only the bottom of a bed frame didn't care whether they bought their own furniture or someone else's. Then the researchers broke out the origami. Once people were shown how to make origami frogs and origami cranes they valued their own creations more highly than paper creations made by experts. When the scientists mixed the origami up, hiding the amateur's creations among the professional's, the DIY origami folders still valued their own creations as highly as the origami done by experts. An independent group, who saw both creations, didn't agree. The general conclusion people come to when they study the IKEA Effect is: People will pay more if they have to put labor into something, not less. I have to wonder if that's the whole story. Do people like their own labor, or do they like control over the finished product? There is value in knowing how something is put together, and what can be done if it fails. The knowledge might be worth more than expert polish. These are low-stakes items. 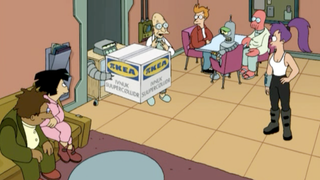 It might be interesting to see how the IKEA Effect works for more than just a box or an origami frog. Would you accept a lower-quality computer if you knew how it was made and could fix it if something went wrong? How much would you value the high grade professional touches on a car, versus knowing what to do when your car breaks down and not having to take it into the shop? Is the IKEA Effect about pride, or is it about power?